The aim of the burn-in is to reach the maximal GPU temperature and power consumption. The burn-in test allows to test the efficiency of the cooling system as well as the quality of the power circuitry. For this burn-in test, I use a new stress test that will be released soon. 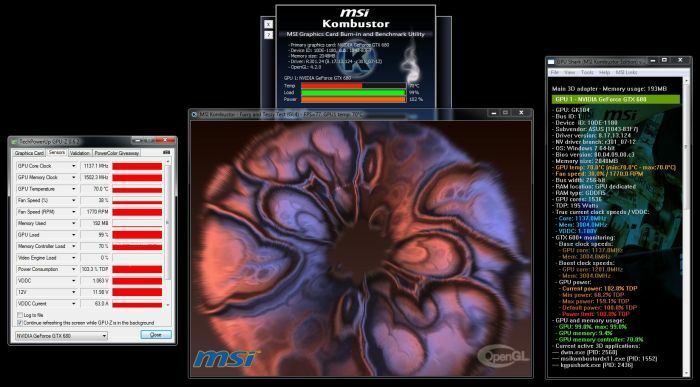 This stress test will be available in MSI Kombustor and mixes fur rendering with tessellation. This stress test is particularly well adapted to burn the GTX 680. 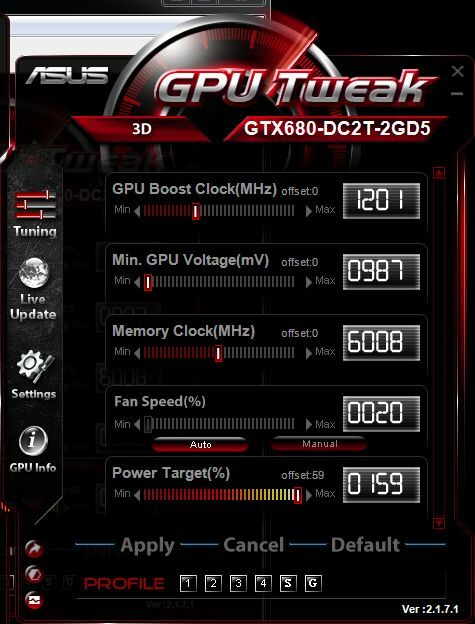 It stresses the GTX 680 harder than FurMark! – GPU current (read with GPU-Z): 72A under a voltage of 1.107V. At idle state, the total power consumption of the testbed is 65W and the GPU temperature is 31°C. Under this highly stressing situation, the DirectCU II cooler is a bit audible but remains quieter than the VGA cooler of the reference board. As you can see, the power consumption does not exceed 120% even if the power target is set to 159%. It’s probably because in this situation, 120% corresponds to the TDP of the GTX 680 DC2 TOP and NVIDIA hardware monitoring does its job by keeping the TDP in under its max value. – GPU current: not exposed by GPU-Z.